In 2007, Rabbi Aharon Lichtenstein, of blessed memory, gave a talk to students reflecting on his career path in Jewish education. At the time, he was one of the heads of a prominent yeshiva in Israel. However, his intellectual journey included stops at Harvard University where he earned a doctorate in English literature and Yeshiva University where he was a student of Rabbi Joseph Soloveitchik, one of the great Torah thinkers of the twentieth century. In his talk he said that his greatest single success is, without a doubt, his family. Rabbi Lichtenstein understood that what is most important is not an academic degree or a prestigious job, but rather family, the bedrock of a meaningful life. 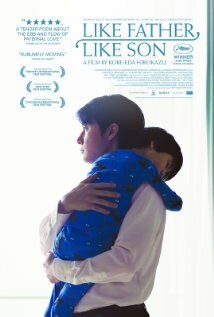 I thought of this as I watched Like Father, Like Son, a moving story of two families whose children are switched at birth, and the consequences of that traumatic event. Ryota Nonomiya is an ambitious, successful, and self-absorbed architect, addicted to his computer whenever he has a spare moment. He sees himself as extremely bright, talented, and possessing a solid work ethic. He rarely shows emotion, and his wife Midori and son Keita long for his attention. On one fateful day, the hospital in which his son was born calls for a meeting with him and his wife. They learn that at birth his real son was switched with the child who presently they view as their son. The hospital acknowledges the error and seeks to place the boys with their blood parents. Ryota and Midori soon meet with the other parents, Yukari and Yudai, people of modest means, but whose home is filled with warmth and love. After getting to know them a little better, they decide to switch children for one weekend. Ryusei, their biological son, spends a tense time in the home of Ryoto and Midori, his real parents, whose home is much more rigid than the one in which he was raised. Keita more easily adapts to the loving home of his real parents who fill the air with laughter and optimism. The switch is extended for more weekends as both sets of parents struggle to determine what to do: keep the child they raised so far or take their blood child. The transition period is difficult since all of the parents have invested much love in their charges. Moreover, the children themselves have difficulty adjusting to the ambiance in their new homes, which are vastly different from their previous ones. What decision will be the wisest given the emotional realities? Like Father, Like Son deals with some important parenting issues. What defines a good parent? Is it one who pushes his child to excel and gives him tangible rewards, or is it one who gives his child an abundance of love, joy, and time? Furthermore, how important is the amount of time you spend with your children? Jewish tradition has an instructive approach on what it means to be a parent. The parent’s mission is to educate the child, not just to bring him physically into the world. The ancient Midrash tells us “he who brings up a child is to be called its father, not he who gave birth.” Parenting, therefore, is both a physical and emotional task, and the wise parent has to connect on both levels. In a sense, the parent is God’s representative on earth, and children need to see parents, like the Divine, as symbols of authority and symbols of love. In the liturgy of the Jew, God is often referred to as “our Father, our King.” What this appellation means is that we relate to God as a King upon whom we are totally dependent, but we also relate to God as the loving father, who sticks with us even when we err. Like Father, Like Son reminds us of the complex nature of parenting, which beckons us not only to instruct but to unconditionally love our children.